How do you start with raising alpacas and end up with beautiful yarn or fiber batts? The first step is shearing. The main process goals are harvesting as much quality fiber as possible and giving the shorn alpaca relief from heat and a nice “hair cut”. You will need alpaca shearing equipment or hire someone that already has the equipment. 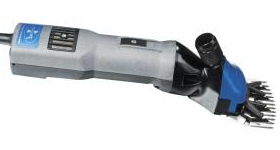 Professional shearers own more than one electric shears and a fair number of combs and cutters. They will also have scissors for “dangerous” areas including the head, the tail and the bib. The alpaca shearing equipment will often include a shearing table. I have tried a couple of shears since 2012. The popular ones are Lister, Heiniger (xTra and xPert) and the Premier 4000s. I own the two Heiniger models and the Premier 4000s. 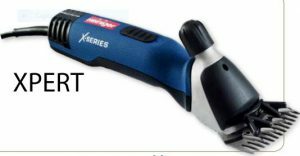 I love the xPert model. It is very forgiving when you are using combs and cutters with slightly worn edges. They will still cut the fiber. They are lite and their grip is smaller than the xTra and the Lister. My first shear was the Premier 4000s. I really enjoyed it because it is lite, a bit slower than the others but worked really well. Unfortunately with the great number of animals (over 150) I shear within a few months, my original Premier 4000s died. This model is great for small herds. A friend of mine owns a Lister shear. It is a really nice machine. I used it when my Premier died. It is a bit heavy and very forgiving. The speed is variable. At full speed, it is much faster than the two Heiniger models. I always bring at least 2 shears with me when I work at a farm. When one gets too hot I switch to the other shear. A good thing about alpaca shearing equipment is the fact that the manufacturers have standardized the combs and cutters. There are many kinds but they are all compatible with the machines. I own about 40 sets of combs and cutters. Some are better than other but the only real test is when you actually shear the fiber off the animal. I like the Spirit comb from Premier1 with the Spitfire cutter. I also use the Blackhawk comb with the Spitfire and they work pretty well. Breeder are more nervous with the shape of the Blackhawk, it looks more agressive. The important characteristic of the comb is the number of teeth. You must use one that has at least 13 teeth. An Apache comb has 9 teeth and the space between the teeth makes it dangerous for alpaca shearing. Skin will fit in between the teeth and the shears cut really well. You do not want a bloody shearing experience. When you use a comb with too many teeth, you will have trouble getting through the fiber. High quality alpaca fiber is very dense. The camelid comb is much more expansive and I did not feel it was worth the difference in price. It will leave a bit more fiber on the animal. If you live in the States, Premier1 does offer a sharpening service for a pretty good price. I am Canadian and having my equipment crossing the boarder was not efficient for me. I chose to get my own sharpening equipment. I bought a two sides motor turning at 4600 rpm and the Heiniger sharpening kit which includes two wheels, emery paper and a pendulum. Heiniger is a Swiss company and they sell full kits including the motor with very secure enclosure however they are not compatible with the American electricity code. I used to send my combs and cutters in Alberta for sharpening and I was loosing lots of times and money. The kit I am using now cost me around $2000 but I have no down time anymore and I can shear more animals from end of April to end of June. Shearing tables are not an absolute alpaca shearing equipment but they make the shearing team and the alpaca lives much easier. When you own two or three animals, you could shear them standing up. When you own a larger herd of 10 or more, using a table with accelerate the process. Shearing standing up can be stressful for the animal if it is not handled very often. The process is much more physical for the shearer who need to stand over than under the animal. The alpaca will protect its legs with its life so shearing standing up is a great challenge specially when you get under the knees on the legs. Mind you, the fiber on the legs is no good however shearing it will prevent mites and other undesirables. If you are harvesting the fiber, you must use some kind of mat to prevent fiber contamination. 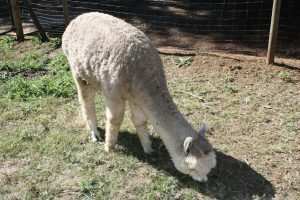 If you have no table, you can use rubber mats right on the ground, muscle the alpaca on its side and tie the legs to posts on the front and the back of the animal. These ties must be easy to release in case of emergency but strong enough to hold the animal still. Do not overtighten. I will discuss this further in a future blog. I can no longer shear alpacas tied down on the ground. I would not be able to walk the next two days. I use a table. My table has a locking swivel so that when we lean the alpaca against the table in the vertical position we can then turn the table. The alpaca is now on the horizontal surface and we tie the legs with special straps. One person must always control the head so the alpaca will not attempt to get off the table. When shearing is done, one member of the shearing team must step on a pedal to unlock the table and turn it back to the vertical position to let the alpaca join the herd. Other shearer use fix position tables made of wood. 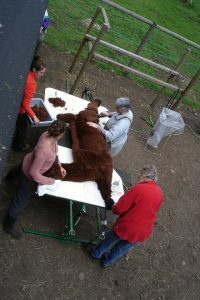 The team has to muscle the animal on its side on the table and tie the legs. The shearing process is the same. Shear one side, turn the animal on the belly then the other side and shear that side. The animal is released feet first on the ground. Another kind of table traps the alpaca using a large cushion against the table, the table is turned and the large cushion is removed when the legs are tied. When the shearer has complete both sides of the animal, the alpaca must be turned back to the original position because on these big tables loading and release are done on the same side. The cushion is again used immobilise the animal before release. I tried such a table. It stands lower than the swivel one I have and I find it harder for the back. If you have any comments of questions on alpaca shearing equipment, feel free to comment this blog. You can also email me and I will reply as soon as possible. It’s a useful information about Alpaca Shearing Equipment. thanks sharing the useful post.